After 3 days of 18-53 mph winds, it was nice to have a break and get out to do some birding. It was a calm sunny morning with the clouds returning at the end of the walk. ​On the way back north we had a flyover of 40 TUNDRA SWANS. We then headed to the Willows but stopped at Spider Pt when I notice a strange silhouette on the rock at the turnoff to the point. It turned out to be a CHUKAR. At the Willows we found MOUNTAIN BLUEBIRDS, CANADA GEESE and 1 CACKLING goose. A SAY'S PHOEBE was flying around. It was a cool morning with a start temperature of 12F, but fortunately there was little wind. I was greeted by a snowy landscape and singing RED-WINGED BLACKBIRDS. Along the frozen ponds. I heard a SONG SPARROW. Along the river I found a RED-SHOULDERED HAWK. I have seen RSHA in 5 locations in the county this year, so maybe they are expanding their range and numbers. Time will tell. Some nice finds were a CLARK'S NUTCRACKER, close observations of PYGMY NUTHATCH, and 2 AMERICAN DIPPERS with both singing and one flying from a rock perch under the bridge to about 1/4 mile up stream. Cool day limited the number of species to 22, but still a nice morning. It was overcast with the approaching winter storm, but there were 14 of us out for the Friday walk through the Caughlin Parkway area. We first headed north to see if the Harris's Sparrow was still around but no luck on that one. There were plenty of WHITE-CROWNED. A TOWNSEND SOLITAIRE was in the area as well as ANNA'S HUMMINGBIRD, a SHARP-SHINNED and a RED-SHOULDERED HAWK. We also saw PRAIRIE FALCON, MERLIN, and many STELLER'S and SCRUB JAYS. We ended the walk with 37 species. Now the snow can fall. There were 6 birders out for a walk around the Damonte Ranch Wetlands. Of note were a LONG-BILLED DOWITCHER, GREEN-WINGED and CINNAMON TEAL, SONG, LINCOLN, SAVANNAH, and WHITE-CROWNED SPARROWS. We had a SORA calling and a close encounter with KESTRELS and HARRIERS. We ended up with 42 species. There were 12 birders out on the first field trip of 2019. The pond was mostly frozen except at the west end and at the outlet on the east end.There were LESSER and AMERICAN GOLDFINCHES, AMERICAN WIGEON, SHOVELERS, CANADA, CACKLING, and a SNOW GOOSE. At the dam just before the marsh area we saw 2 VIRGINIA RAIL and heard a third. Near the end of the walk a BALD EAGLE flew over and up went the CALIFORNIA and RING-BILLED GULLS. We ended the walk with 38 species. There were 9 birders out for the walk through Silver Saddle Ranch. We headed to the dam first and on the way we found COOPER'S HAWK, RED-TAILED HAWKS, RAVENS in the air, and on the river we saw GADWALL, COMMON GOLDENEYE, COMMON and HOODED MERGANSERS, PIED-BILLED GREBES. At the dam 2 AMERICAN DIPPERS were seen. We also saw a SLATE COLORED JUNCO at the ranch house. We ended the walk with 34 species. That ends this year’s field trips, especially with all the CBCs going on. When I woke up the sky was very dark but the clouds were breaking on the way to the park resulting is a great sunrise. In spite of the gloomy weather, there were 7 birders out. The walk was mostly cloudy with a few flurries and the first birds were MALLARDS on the pond. Quiet so far. At the group picnic area while looking for Wrens one of the birders in the group spotted a STELLERS JAY and then a VARIED THRUSH then a second. We then ran into a mixed flock of MOUNTAIN CHICKADEES, BROWN CREEPERS, BEWICKS WREN, WHITE-BREASTED and RED-BREASTED NUTHATCHES, and RUBY and GOLDEN-CROWNED KINGLETS. NICE. We then head to the group camping area and we did find a PACIFIC WREN but the guy had nothing to do with giving us a photo op. It was quiet walking through the park to the north end and then back to the parking area. We then walked down to the horse parking area were we found JUNCOS, BUSHTITS, GOLDEN-CROWNED SPARROWS, DOWNY and HAIRY WOODPECKERS. We ended the walk with 28 species. It turned out to be a great walk, much better than expected at the start of the day. After the walk I did a tour of the Washoe Valley along Alt 395. I saw WESTERN BLUEBIRDS, 34 RED-TAILED HAWK, 9 HARRIERS, ROUGH-LEGGED and FERRUGINOUS HAWKS. The hawks are back. It was a cool morning but that didn't deter 9 birders showing up at Oxbow Nature Study Area. In the parking lot we saw FLICKERS, ROBINS, and a DOWNY WOODPECKER. There was nothing on the pond but at the river we saw the resident RED-SHOULDERED HAWK perched in a tree along the river. We also saw a COOPER'S and SHARP-SHINNED HAWKS. There were very few sparrows with only a WHITE-CROWNED, 3 SONG, and SPOTTED TOWHEES. There were many STELLERS and SCRUB JAYS all through the park. Near the end of the walk, right in front of us, flew in an immature RED-TAILED HAWK being pursued by a RED-SHOULDERED HAWK. The RTHA was banded, which looked like NV041. A second look at the pond yielded a female GADWALL, MALLARD, COOT, and a BLACK PHOEBE. Three of us headed over to Idlewild Park where there were a few new birds: COMMON GOLDENEYE, COMMON MERGANSER, and AMERICAN and LESSER GOLDFINCH. We ended the walk with 37 species. The cooler mornings are upon us but it warmed up nicely for the eight birders who came out. The morning started off with many flights of CANADA GEESE heading northeast. Some good finds were a YELLOW-HEADED and RED-WINGED BLACKBIRDS, a single GOLDEN-CROWNED with many WHITE-CROWNED SPARROWS, and 5 NORTHERN MOCKINGBIRDS. We found a single AMERICAN WIGEON, a few NORTHERN SHOVELER, a PIED-BILLED GREBE, and for me it is always a good day when I find WOOD DUCKS. We saw light to dark morph RED-TAILED HAWKS, KESTREL, as well as COOPER HAWKS and a PRAIRIE FALCON in the same area we found them last year. We ended the walk with 38 species. Six birders showed up and we were curious whether the 500 CANADA GEESE in the grassy area would yield other geese. The answer to that was “no.” We did find my First of Season (FOS) AMERICAN GOLDFINCHES as well as returning WHITE-CROWNED and GOLDEN-CROWNED SPARROWS. Along the Nature Trail we found a GREAT HORNED OWL, a VIRGINIA RAIL calling from the cattails, a RUBY-CROWNED and a surprise GOLDEN-CROWN KINGLET. We ended the walk with 41 species. Fourteen of us enjoyed a wonderful Fall day in Sierra Valley, surrounded by raptors and other birds — 22 species in all. The trip started beautifully with 2 Golden Eagles on the same power pole, and Red-tailed Hawks all over the place — 78 by the end of the trip (a nice mix of both adults and immatures). There were also 11 Northern Harriers, 8 Ferruginous Hawks and 2 American Kestrels. Along the way we also saw large flocks of Horned Larks (probably 150 or more), Brewer’s Blackbirds (well over 200), and the ever-present Common Raven (probably 200 or more). There were numerous LBJ’s flitting in and out of the bushes and fences — Savannah Sparrows and White-crowned Sparrows — moistly avoiding any good looks. A lone Sage Thrasher excited many of us, some of whom hadn’t seen that species before (or at least not in a long time). There were also 2 Great Blue Herons, about 18 Rock Pigeons, 1 small flock of California Quail, 4 Northern Flickers, 2 Red-winged Blackbirds, 4 Western Meadowlarks, at least 7 Black-billed Magpies, 7 American Pipits, and 1 unidentified gull (California?). Surprisingly, the area along Harriet Lane was unusually dry, as was the usually flooded area at the beginning of Marble Hot Springs Road (and the headwaters of the Feather River didn’t look very full, either). Consequently, we only saw 2 American Coots and 8 Mallards — and no other waterfowl. All in all, a very satisfying day, except for the surprisingly dry conditions where usually there were lots of wetlands, but not this year. The cool weather is upon us but the sun was out warming us and the birds. 12 participants started out at Cottonwood Park and found 12 species without moving. Raptors were KESTREL chasing a MERLIN, and RED-TAIL HAWKS. The only waterfowl were COMMON MERGANSER, MALLARDS, CANADA GEESE, and PIED-BILL GREBE. The WHITE-CROWNED SPARROWS were back in force with over 150, also GOLDEN-CROWNED, SAVANNAH, and SONG SPARROW. With Veteran's Parkway open, we crossed the bridge over the Truckee River where we counted 34 RED-TAIL HAWKS, 7 KESTRELS, HARRIER, PRAIRIE FALCON, COOPER'S HAWK, and a MERLIN. There were GREAT EGRETS, GREAT-BLUE HERON, RAVEN, over 65 CROWS, and 100+ AMERICAN PIPITS in the fields. We ended the walk with 47 species. While we were gathering the 9 participants saw a BALD EAGLE, HARRIERS, and a flyover of an OSPREY. There were a few ducks but they flew off when we go within 100m of them. There were MALLARDS, WIGEON, SHOVELER, RUDDY DUCKS and GREEN-WINGED TEAL. Some of my favorites were COMMON YELLOWTHROAT, RED-NECKED PHALAROPE, KINGFISHER, and a very cooperative VIRGINIA RAIL. We ended the walk with 46 species. While driving to Pyramid Lake the temperature dipped to 36F but warmed up to high 50's when we met at Popcorn Rock. We first scoped the south end of the lake seeing most of the regulars and only a few LEAST SANDPIPERS also 1 CANVASBACK and flyby of 2 COMMON MERGANSER. We walked to the delta and on the way we found a Tarantula Hawk and a Thread-waisted Wasp. At the delta the only shorebirds were WESTERN SANDPIPERS and KILLDEER. Gulls were CALIFORNIA, RING-BILLED, and 2 BONAPARTE'S GULLS as well as CASPIAN and a single FORSTER'S TERN. There was a high number of COMMON MERGANSERS (61) and a PRAIRIE FACLCON. Along the tree line about 50m from the river, we found YELLOW-RUMPED WARBLERS, a WHITE-CROWNED SPARROW, and WESTERN TANAGERS. We ended the walk with 46 species even with the low number of shorebirds. On the way back I stopped at Lockwood RP and the trail restoration work has been completed. I did find a single LEWIS' WOODPECKER at the west end of the park. Also, a BELTED KINGFISHER swimming in the river. Yes, Fall is upon us and the temperature is falling. It was a nice morning and 10 birders started at the boat ramp and walked towards the Scripp's WMA. We found HORNED LARKS, COWBIRDS, CLARKS, and WESTERN GREBES with young, PIED-BILLED GREBES, and a surprise 2 female WOOD DUCK. Along the road through the Scripps WMA we saw YELLOW-RUMPED, ORANGE-CROWNED, and YELLOW WARBLERS. We then headed over to Bellevue Ave and we saw SPOTTED, LEAST and WESTERN SANDPIPERS as well as CASPIAN TERN. We ended the walk with 49 species. It was a very nice cool and clear morning with a hint of fall in the air especially at 8700ft. It was nice not to have all the smoke in the air. There were 12 birders out and with the early 7a start there was a lot of bird activity. We found HERMIT, ORANGE-CROWNED, YELLOW-RUMPED, NASHVILLE, and MACGILLIVRAY'S WARBLERS. There was a high number of CLARK'S NUTCRACKER, young PINE SISKIN, and WESTERN WOOD-PEWEE, DUSKY, and a WESTERN FLYCATCHER. We ended the walk with 26 species. It was nice to get a day without the smoke from the California fires. Also, the temperature was down with a hint of the coming Fall. There were 6 birders out and we started at the ponds. Not much there but MALLARDS and PIED-BILLED GREBES. We walked to the river at the bridge where there were about 20 CLIFF SWALLOWS and then a VAUX SWIFT flew in and we saw it 3 times during the walk. Along the river we saw BLACK PHOEBE, HOUSE WREN, TREE SWALLOWS, WARBLING VIREO, YELLOW WARBLER, and young NASHVILLE WARBLERS. Three of us continued along the river and the highlights were a KINGFISHER, BAND-TAILED PIGEONS, and a DIPPER. We ended the walk with 43 species. Nice morning. The smoke from the California Fires reached the Reno area making for a blood red sunrise. There were 12 birders that met at the lower end of the canyon and we drove up the fire road about 1.5 miles to start the walk. We first walked up the canyon along the cliffs and found MACGILLIVRAY'S WARBLERS singing, FOX SPARROWS (thick-billed), WARBLING VIREOS, WESTERN WOOD-PEWEES, and YELLOW-RUMPED WARBLERS. We started the next part of the walk to Dry Pond and 2 of our sharped eye birders found a RED-BREASTED SAPSUCKER, a COOPERS HAWK perched in a tree, and at least 2 CASSIN'S VIREO with a fledgling. Along Dry Pond Trail we found RED-BREASTED, WHITE-BREASTED, PYGMY NUTHATCHES, BROWN CREEPERS, and CLARK'S NUTCRACKERS. At the pond we found juvenile CHIPPING SPARROWS, WESTERN and a male MOUNTAIN BLUEBIRD that was chased off by the WEBL. A surprise was a MOUNTAIN QUAIL that called twice, which was nice, as we looked into the smokey Washoe Valley. We ended the walk with 38 species, which was a surprise to me for this habitat and time of year. Hope you can join us next time. It was a cloudy morning, which kept the temperature down but brought out the mosquito. 3 birders saw and heard many SONG SPARROWS, a couple of CHIPPING SPARROWS, an OSPREY flew to the north side of the lake, and many WARBLING VIREOs. On the south end of the lake we saw a pair of MACGILLIVRAY'S WARBLERs carrying food, heard EVENING GROSBEAKs, and WOOD PEWEE. We didn't find CASSIN'S VIREO until we reached the east side and the Vireos and MOUNTAIN CHICKADEE where in an uproar. The reason for all the raucous was a COOPERS HAWK. We found a RED-BREASTED SAPSUCKER and heard a HERMIT THRUSH singing. The only water fowl was CANADA GEESE, a couple of MALLARDS, and a PIED-BILLED GREBE. We ended the walk with 40 species. Not bad for a woodland habitat. There were 12 birders out on the walk around Lower Tahoe Meadows. The first bird was a MOUNTAIN QUAIL calling from the north side of Mt Rose Highway and we heard another in the canyon at the east end of the meadow. We saw a HERMIT THRUSH singing, a LINCOLN'S SPARROW carrying food, and we followed a male WILLIAMSON'S SAPSUCKER around to get a few photos. We ended the walk with 29 species and a couple of us went to the Interpretive Loop where we found a pair of Willianson's Sapsuckers flying around the south side of the trail carrying food. Nice day. Another nice morning and the earlier 7am start makes a difference. There were 7 of us out and of special note was the very low number of warblers with only 2 YELLOW WARBLERs seen. Young birds are showing up with juvenile ROBIN, MALLARD, and CALIFORNIA QUAIL being seen. We were very lucky to see a VIRGINIA RAIL for about 10s. A single male RUDDY DUCK was on the pond and we saw the COOPER'S HAWK on nest and the female was not happy with us loitering close to the nest, although we were on the path, and she dove at us flying a few feet above our heads. It was a cool 37F at the start of the walk but as soon as the sun came up it turned into a wonderful morning. 18 birders showed up and as we were grouping up a croaking COMMON RAVEN was keeping a eye on us. We first walked to the Carson River Park where we found BARN OWLs in the usual Cottonwood and before the walk I saw a juvenile in the same cavity. We saw and heard at least 24 BULLOCK'S ORIOLEs and 41 HOUSE WRENs. Some unusual finds were a immature BAND-TAILED PIGEON, BLACK-CHINNED HUMMINGBIRD, BLUE-GRAY GNATCATCHER, WOOD DUCK, at least one BANK SWALLOW, and singing LAZULI BUNTING. The walk was about 4 hours and we ended with a total of 54 species. Thanks for all that shared the morning with me. It looked like it had rained over the night but at the start of the walk it was warm so no jackets required. 10 birders were out on arguably the hardest walk of the year at Hunter Creek Canyon. I talked to contractors about a month ago and they said that they were putting in a bridge in 2 weeks but that hasn't happened. So we had to do some scrambling to get to the trail. We had singing SPOTTED TOWHEE, CALIFORNIA JAY, QUAIL, and singing WESTERN MEADOWLARKS in the parking lot. Some wildflowers were starting to bloom along the trail and we were shortly awarded with a look up at a GOLDEN EAGLE (two were seen together later in the walk). We had a quick flyby of a LAZULI BUNTING and had closer views all along the walk. BH GROSBEAK singing, many BEWICK'S, a HOUSE, and we did hear a CANYON WREN singing at the last cliff face. On the way back were heard a YELLOW WARBLER, saw BULLOCK'S ORIOLE, and an OLIVE-SIDED FLYCATCHER. We found our target species, Canyon Wren and Lazuli Bunting and ended the walk with 26 species. I was too caught up in the warm weather and putting in my garden to realize a front was moving in. I woke up to 32F and at the park it was in the low 40's with a little wind. It looked like rain all through the walk, but that did not stop the 18 birders from finding some great forest birds. Of course, STELLER'S JAYs, HOUSE and BEWICK'S WRENS. We also found BLACK-HEADED GROSBEAKs, NUTHATCHES, TANAGERS, PEWEEs, and a HAMMOND'S FLYCATCHER. There also were HAIRY WOODPECKER and a RED-BREASTED SAPSUCKER. WARBLING and CASSIN'S VIREOs were in the group campground. We walked around the pond and on the south side we found a flock of EVENING GROSBEAKs, and on the second pass on the Nature Trail on the south side of the pond we found 2 CALLIOPE HUMMINGBIRDs, which were later than the last couple of years. Although a cool morning we did find 43 species. Thanks to all that came out. The forecast was for wind but with temperatures in the upper 50's and that was what we got. Six birders joined me on the walk and the wind made it difficult to heard the bird songs. The first bird was a pair of KILLDEER with the female feigning a hurt wing then return to her nest when we backed off. As we were gathering we had a flyover of a SANDHILL CRANE. Raptors were a BALD EAGLE, RED-TAILED, HARRIER, VULTURES, and KESTREL. The CANADA GEESE were swimming with young. YELLOW-HEADED, RED-WINGED BLACKBIRDS and MARSH WREN were in the reed area. At the south end near the line of Cottonwoods, we found a GRAY FLYCATCHER and a pair of WESTERN KINGBIRDs. We ended the walk with 46 species with a low number of waterfowl. After the walk I headed to Centerville Lane and found TRICOLORED BLACKBIRDs, 2 at the pond at Hwy 88 and most were at a flooded field about midway from 88. Then on the way home I stopped at Washoe Lake SP at Bellevue and found a nice number of CASPIAN and FORESTER'S TERN. With the wind the Forester's were motionless as they looked for fish. Nice day of birding. It was a sunny calm morning and 7 birders showed up at the earlier start time of 7:30 am. At the parking area we had BARN SWALLOWS and 2 singing VIRGINIA RAIL. We had flyby of a GREATER YELLOWLEG and 2 WILLET. We walked along the south side of the Veteran's Pkwy where the next Swallow was CLIFF then TREE, NORTHERN ROUGH-WING, and BANK. On the water we saw AVOCET, STILT, LEAST, and WESTERN SANDPIPERS. Plenty of RED-WINGED and YELLOW-HEADED BLACKBIRDS but no females but I did see one later in the day at the So Meadows Wetlands. We heard SORA singing, flyby of AMERICAN PIPITS, KESTREL, and PEREGRINE FALCON. A treat was seeing a courtship display by the HARRIERS where the male dropped a squirrel and the female catching it in midair. We ended the day with 57 species and that didn't include a Red-tailed Hawk or Say's Phoebe. Photo by Dave Jickling. Dave says there are 3 males and 4 females in the photo. ​Fourteen hardy folks, including four UNR Environmental Club members, joined me at 4:30 AM to begin the annual Sage Grouse trip. This year’s trip corresponded with a blue moon and for most of the participants watching the Sage Grouse courtship was on their bucket list as well. We arrived at the lek about 6:30 AM and watched a dozen males actively dancing for perhaps as many females. It was a beautiful morning with Western Meadowlarks and Horned Larks singing all around us as a small herd of Pronghorn moved along the slope of Shaffer Mountain. Around 8:30 the grouse flew in mass from the lek and our morning of Sage Grouse watching was over. We then drove to the Honey Lake Wildlife Area, 7,600 acres of sagebrush habitat surrounding Honey Lake. This is an excellent area to see hundreds of migratory and nesting waterfowl, birds of prey, Sandhill Cranes, and Mule Deer. We saw several small flocks of Greater White-fronted Geese grazing in the fields around the refuge and heard and finally saw thousands of Snow Geese flying in flocks with the snow caped mountains to the west. Great views of a pair of nesting dark morph Red-tailed Hawks, American Kestrels, Northern Harriers, and numerous waterfowl. We ended our trip with some quick views of Acorn Woodpeckers in a small oak grove along US 395. All though daunting to get up so early, this trip is always worthwhile. It was a beautiful spring day and there were 10 of us out for a walk through the woods. We started at Timberline and the Forest road leading to the parking area. We first walked along Timberline where we counted 10 SPOTTED TOWHEEs singing away. Last week a BARN SWALLOW showed up but today there were 4 and it looked like 2 pairs. CALIFORNIA QUAIL were in high numbers compared to a couple of weeks ago. In the sagebrush habitat we counted 22 CALIFORNIA SCRUB-JAYS. A RED-TAILED HAWK was flying over Thomas Creek Canyon. There was another hawk in the top of a conifer. At first I thought it was another Red-tailed Hawk, but as we got closer and the light was better it turned out to be a COOPER'S HAWK. As we walked up the canyon, we had our first encounter with CASSIN'S FINCHES, leaving the HOUSE FINCHES at Timberline. All along the fire road we heard Cassin's Finches singing. We estimated 75 and that was probaly a low number. We saw a male WHITE-HEADED WOODPECKER and soon after that a RED-BREASTED SAPSUCKER. The single Sapsucker turned into 2, then a 3rd showed up. They put on a nice show. We also saw WESTERN BLUEBIRDS. One of the last birds seen was a close encounter with a WHITE-BREASTED NUTHATCH, which landed right next to me at about 1-2 feet away. We ended the day with 29 species; a good number for the woodland habitat. On another note, I did a swing around Washoe Lake SP and the GREAT-HORNED OWL has at least 2 recently hatched owlets. It was a little cool at the start, but it warmed up nicely as the morning went on. There were 3 birders. At the park we started off with over 10 species including a flyby of a SHORT-EARED OWL. The TURKEY VULTURES have returned and we saw 2 RED-TAILED HAWKS on nest. CANADA GEESE were perching on fences, rooftops, and on logs, strange. As we got closer to the new Veteran's Pkwy bridge, we first saw a NORTHERN-ROUGH WING SWALLOW on a wire crossing the Truckee, then a TREE SWALLOW, next CLIFF, then a BARN, and then VIOLET-GREEN. Only missing was a BANK SWALLOW but on the return one flew over us. Nice, and all the Swallows in less than a half-hour: welcome Spring. We got back to the cars and decided to continue to the McCarran Bridge in hopes of turning 47 species into 50. 48 was a RUBY-CROWNED KINGLET, then a flyby of a COMMON GOLDENEYE; only one more. After reaching the bridge and on the way back to the Park, Sara found 50 on the river: a COMMON MERGANSER. Who likes round numbers? Not me. 51 was a MERLIN. Then a Prairie Falcon flew in and perched in a Cottonwood, giving us great views although almost straight up. A nice ending for the walk. It was in the upper 20's when the walk started but with no wind it was pleasant. There were 8 birders out and we started at Popcorn Rock but not much there except for COOTS and SONG SPARROWS, which were singing more like Sagebrush Sparrows with an extended song that was about twice as long as the normal 2 part song. After Popcorn Rock we drove to the south-most part of the lake and walked to the delta. Along the way we saw WHITE-CROWNED and SAVANNAH SPARROWS, AMERICAN PIPIT, HORNED LARKS and a fly over of AMERICAN WHITE-PELICANS. The only ducks we saw were BUFFLEHEAD, MALLARDS, GADWALL, GREATER SCAUP, and a flyby of NO. PINTAILs. The number of ducks were less than 10 except for the Mallards. After the walk Justin and I went looking for the HARRIS' SPARROW, which we did find with the 35+ WHITE-CROWNED along the road that runs past the lower single water tank. The first bird we found was a singing SAGEBRUSH SPARROW. We ended that walk with 30 species (including the hatchery birds) and a very nice day indeed. On an unusually warm morning for this long-standing field trip, some 14 folks spent nearly three hours slowly viewing the 14 species of birds seen on the water and in the nearby trees and skies. It was quite a cosmopolitan group, made up of some newcomers to the Reno area from southern California, Missouri, Connecticut, and New York. At a couple of stops, folks using the walk around the lake joined us to view some of the birds. The highlight bird for many was the sighting of three Black-crowned Night Herons in the pines near the southwest portion of the lake. As their name implies, they were all three sleeping during the day. We were fortunate to have a PhD student from UNR and his wife, both very knowledgeable of water birds, who shared that with the group. And, thanks to Kathy for keeping a running list of the birds. We had a great turn out on a wonderful winter day with a hint of the spring to come. 24 birders showed up and we started at Deadman's Creek where we heard and saw 4 BEWICK'S WRENs No Long-eared Owls were seen, but we did find a returning pair of GREAT HORNED OWLs with one on the nest. We walked over to the pond adjacent to the camping area and found AMERICAN WIGEONs, GREATER YELLOWLEG, AMERICAN PIPIT, KILLDEER, AND A LONGERHEAD SHRIKE. When we got back to the group picnic area most of the group headed out but a few of us continued north along the shore in search of a white bird we saw as we neared the start of the walk. We did find it with a female MALLARD: a WHITE PEKIN DUCK with the female MALLARD, which was unusual for the area. Finally, we found a nesting WESTERN SCREECH OWL. We ended the walk with 20 species and thanks to all who came out. It was a cool morning with the tail end of Thursday's storm sailing east giving us an amazing big sky moment over Mt Rose. There were 11 birders out with a few others missing the meet up. Notable birds were 3 VIRGINIA RAIL calling as well as a SORA. Nice variety of waterfowl with 12 species and a leucistic MALLARD which I first saw last spring as a orange juvenile and then as white immature. It seems to be a female as she flew off with a male. We did see wading birds: a GREAT EGRET and a GREAT BLUE HERON. We also had a nice collection of Sparrows including WHITE-CROWNED, SAVANNAH, LINCOLN'S and SONG. After the front moved on and the sun came out it turned into a very pleasant end to the walk and we finished with 42 species. The Diamond Creek Pond, a little unknown birding hotspot, didn't disappoint on Friday's outing. There were 15 birders out to walk around the pond and a visit to the marsh on the east end. The first bird was a flyover of a SNOW GOOSE. A RED-TAIL HAWK perched on one of apartment buildings. If you have visited the area before the summer you will be surprised at the changes. The are 250 apartments on the west end closing in the pond similar to Virginia Lake. However, the number of species was great although the number of individuals were low. Notable birds were a female COMMON GOLDENEYE, HOODED and COMMON MERGANERS, 2 immature BLACK-CROWNED NIGHT HERON, 4 VIRGINIA Rail calling, 2 WILSON SNIPE seen flying into cover, a BELTED KINGFISHER along the marsharea, 2 LINCOLN'S SPARROWS, many AMERICAN GOLDFINCH and only 2 LESSER GOLDFINCH and a calling PINE SISKIN. At the end of the walk and as I was pulling out of the area I saw a NORTHERN HARRIER making for a total of 41 species. Thanks for everyone that joined me on the walk. 21F. The sun was partially blocked, so the morning and the walk were cool enough to walk faster than usual. I was joined by 5 other birders and we first headed toward the Carson River Park where we found a BARN OWL roosting in a Cottonwood near the parking lot. We found FLICKERs, RAVENs, BEWICK'S WRENS, JUNCOS, and SONG SPARROWS. No Dipper at the dam, but we did see a HERMIT THRUSH, COMMON GOLDENEYE, and MALLADS on the river. Raptors were RED-TAIL, COOPER, and KESTREL. The total species list was 25 on one of the coolest walks so far but there was no wind so we had that going for us. It was a little chilly at the start but it warmed nicely. There were 8 birders out and our first birds were STELLER'S JAY, RED-TAIL HAWK, and FLICKER, RED-SHAFTED. It was quiet along the Discovery trail that runs through the sage brush, but we did find a BEWICK'S WREN. We walked along the transition between the Conifers and the sage brush habitat at the north end of the park where we encountered HOPE: MOUNTAIN CHICKADEEs. With them were all three NUTHATCHs: PYGMY, RED-BREASTED and WHITE-BREASTED. We came across another flock of Chickadees and Nuthatches at the creek that runs through the camping area and with them were RUBY and GOLDEN-CROWNED KINGLETs with a DOWNY WOODPECKER thrown into the mix. We walked along the ditch at the south end of the park and found many DARK-EYED JUNCO (OREGON) and a SLATE-COLORED. Also, more Chickadees and Nuthatches, a GOLDEN-CROWNED SPARROW and LESSER GOLDFINCHES. The only bird on the pond was a single AMERICAN COOT. The morning yielded 20 species with the last being an AMERICAN KESTREL as we were leaving. MALLARDS and a female COMMON GOLDENEYE. At the end of the walk we returned to pond and the COGO was back and let us get close for photos. The were many STELLER'S and CA SCRUB JAYS as well as 12 NORTHERN FLICKERs. We saw 2 RED-SHOULDERED HAWK, SONG, WHITE-CROWNED, and a LINCOLN'S SPARROW. A SPOTTED TOWHEE gave us a great photo op while he was feeding on olives. There were numerous HERMIT THRUSH, HOUSE FINCH, LESSER and a flyover of an AMERICAN GOLDFINCH. We saw and heard 33 species at the end of the walk. Ten birders left in 4 vehicles to visit the Sierra Valley about 30 miles northwest of Reno yesterday morning. The weather was perfect with clear skies and no wind. We saw about 30 species, the best being two Barn Owls and at least one, and maybe two Prairie Falcons. Raptors were plentiful including scores of Northern Harriers and Red-tailed Hawks, at least a couple dozen Ferruginous Hawks and American Kestrels, and at least 3 Rough-legged Hawks. Details in ebird. It was a cool morning and a little windy with a weak storm coming in requiring, at least for me, 5 layers. I was surprised that there were 8 birders out for a walk through this neighborhood. The first birds were CANADA GEESE, MALLARDS and I heard a PINE SISKIN but couldn't find it. Walking south on the trail and at the second pond we found HOODED MERGANSERS, which was very nice. We also had HOUSE FINCHES, LESSER and many AMERICAN GOLDFINCHES. There were over 50 JAYS with an almost equal STELLER'S and CA SCRUB. We walked up to the Steamboat Ditch where we saw a COOPER'S and 2 SHARP-SHINNED HAWKS. When we got back to the trail, there was a cherry tree with fruit and we had great views of HERMIT THRUSH. On the way back we had a great view of a NORTHERN FLICKER drinking from the creek. Near the cars we had a RED-BREASTED NUTHATCH stashing pine nuts and it was at eye level and so close I had to step back to get the guy in focus. We saw and heard 32 species. Oh yeh, I almost forgot that we saw DARK-EYED JUNCOS many OREGON and 1 SLATE-COLORED. It was a cool morning and it snowed earlier in the day covering the mountains in white. There were 3 birders out and it was a little chilly with the addition of light winds. The CANADA GEESE are starting to return and the only ducks we saw were MALLARDS, NO. SHOVLER, and a single female GREEN-WING TEAL. The highlights were all the raptures RED-TAIL, COOPER'S, SHARP-SHINNED, PRAIRIE FALCON, and 2 KESTRELs. A Kestrel flew into the area where the Prairie Falcon was perched and we had a great show where the PRFA was pursuing the the Kestrel for about a minute until they flew out of sight. The Kestrel had a few close calls but I think she escaped since we saw the PRFA down the trail with nothing. The morning warmed up nicely and at the end of the walk I was able to take off my outer layer. A total of 32 species were seen. Nice birding a great view of the snow covered mountains. When: 10/6/17, Friday, 8:00 a.m. to 11:00 a.m. It was a cool morning but it warmed up nicely with no wind. There were 3 birders out and one of the first birds we saw was a BEWICK'S WREN. Other birds of note were GREATER YELLOWLEGS, 19 MOURNING DOVES, COLLARDED DOVES, a PRAIRIE FALCON, BLACK PHOEBE, a BLUE-GRAY GNATCATCHER, returning RUBY-CROWNED KINGLET, and 4 SPARROWS: WHITE-CROWNED, SONG, GOLDEN-CROWNED, and LINCOLN'S. Near the end of the walk we heard a BELTED KINGFISHER and another was seen along the ditch that runs next to the new Veterans Pkwy extension. Also, along the Ag Fields we saw a large flock 100+ AMERICAN PIPITS. We saw and heard 42 species on a great day for birding. ​On 9/22/17, 4 birders came out after the Thursday snowstorm that passed through the Reno/Carson area. I came up Pyramid Hwy and ran into snow on the highway leading to Popcorn Rock. Although it was cool the sun was out making for a very pleasant morning with gorgeous big sky clouds. We started at Popcorn Rock with scoping but all the birds were about a 1/2 mile south where the lake shore started. After 20 minutes or so we drove south to the first dirt road (if coming from the south it is the next dirt road north of the Tahoe/Pyramid Trail Access Road). This is where you should start with the lake at this level because there are Willows below the area where we parked resulting in ORANGE-CROWNED, NASHVILLE, MACGILLIVRAY'S WARBLERS, WARBLING VIREO, and a GRAY FLYCATCHER. As we moved toward the shoreline we encountered 3 COMMON YELLOWTHROATs and a SHARP-SHINNED HAWK. Along the shoreline we saw AMERICAN WHITE PELICAN, SAVANNAH, LINCOHLN'S, WHITE-CROWNED, and SAGEBRUSH SPARROW, LEAST and WESTERN SANDPIPERs. On the way back we had flyovers of BARN, VIOLET-GREEN, and TREE SWALLOWS. We saw and heard 51 species on a wonderful morning of birding. At 7.30 AM nine birders joined us for a birdwalk around the Arboretum Loop to Herman Pond and the Pasture Loop, then back to the museum. The morning was chilly but warmed up nicely for good birding weather. Our first treat was good views of two Orange-crowned Warblers in good light, just above eye level foraging in a pine tree. Heading east out of the demonstration gardens we watched a flock Mountain Chickadees actively moving between trees – look quickly to see the bold white eye-line. Lesser Goldfinches were feeding among the (?) plants where we could look down on them as they bounced around up to the seed heads and down to the ground then up to the large bushes and back again in a busy flurry. The American Coots at the pond still had young ones, or “teenagers.” One obligingly showed off its crazy green feet – leaving no doubt that they are NOT ducks. Thanks to all who joined us for a pleasant almost fall birdwalk. Here’s a list of the 21 species seen and/or heard by at least 2 members of the group. It was a pleasant morning with low wind. There were 18 birders out meeting at Little Washoe Lake. We gathered there and then headed to Bellevue Rd. I got there around 7:30 and heard a CASPIAN TERN and that was the first bird and later after all but one left around 11a I saw the Tern on a flyby. Another bird that was unusually was a dark Gull. I took a couple of photos as it flew by and wrote it off as a 1st year California Gull but when I processed the images I noticed that it wasn't a CAGU but a LESSER BLACK-BACKED GULL. I assume that it is the same 1st year going into 2nd winter gull that has been reported in the area. At Bellevue we did find the SEMIPALMATED SANDPIPER and some of us had a good scope view with a LESSER SANDPIPER near by for comparison. The were a large number of WILSON'S SNIPE (14), WHITE-FACED IBIS, FORESTER TERNs, an ORANGE-CROWNED WARBLED in the willows and 3 SWAN GEESE (domestic type), which I had first seen there in August. I still find it amazing how relaxing birding is and how I can spend 2 hours in one place looking at them. Just got back from this mornings field trip along the Truckee River starting at Mayberry Park. There were 14 birders out in a some what warm morning. We first headed west and encountered numerous HOUSE SPARROWS, ROBINS, and, BREWERS BLACKBIRDS. There was also CALIFORNIA SCRUB and STELLAR'S JAYS all along the walk. Of note was 105+ CEDAR WAXWINGS, which was a large count and an indication of the coming migrants. The small farm along Aspen Glen Dr. was a treat when Jason, one of the owners, invited us into their barn to see a pair of GREAT HORNED OWLS. They flew out of the barn right over our heads: very cool. Over at Dorostkar Park we saw a NO. FLICKER, an immature BLACK-HEADED GROSBEAK, and 2 BLACK PHOEBEs as well as WESTERN WOOD-PEWEE and a DUSKY FLYCATCHER. Warm morning with more on the way and we heard and saw 31 species. Thanks to all who game out. A Sunny and calm Saturday morning greeted the small group of attendees on the Spooner Lake bird trip. We completed the entire two mile loop around the lake and observed 19 bird species. A fun time was had my all. Flocks of mountain chickadees, in the Jeffrey pine forest, produced several other mountain species including the white- and red-breasted nuthatches, and the brown creeper. Three species of woodpeckers were observed. We were delighted to count the white-headed woodpecker and red-breasted sapsucker among them. Foraging in the trees and on the forest floor were the dark-eyed junco and American robin species. As we approached the willow section of the lake we searched for warblers and found an orange crowned and Wilson’s playing hide-and-seek in the shrubs. A warbling vireo was also observed in the willow area. We flushed an accipiter species (Cooper’s or Sharp-shinned hawk) out over the edge of the lake. After seeing little on the lake for most of the morning we came across two pied-billed grebes and less than the usual number of mallards. With the water level higher than the past many years the grassy area near the aspen stands was not to be seen. As we worked our way past the aspens and into the dry, shrubby area of the lake a green-tailed towhee showed itself in the middle of the trail and everyone got a look. didn't hear or see a single Warbler and only saw one GRAY FLYCATCHER. At the pond there were juvenile PIED-BILLED GREBE and COOTS. There were a few RUDDY DUCKS and many MALLARDS too. A highlight for me was a flyby of what looked like an immature VIRGINIA RAIL. It was a very quiet and calm morning with only 26 species being seen or heard, which is a low count for this area. Grosbeak but not luck on that bird. We did see CLARKS NUTCRACKER, PINE SISKIN, CASSINS FINCH, WHITE CROWNED SPARROW (DARK-LORE), and MOUNTAIN CHICKADEE. I was excited about a possible Chestnut-backed Chickadee but after looking at the photos and some other input it appeared to be a Mountain Chickadee with what may be browning from resin. Sorry gang about the mis-identification in the field. didn't hear or see a single Warbler and only saw one GRAY FLYCATCHER. At the pond there were juvenile PIED-BILLED GREBE and COOTS. There were a few RUDDY DUCKS and many MALLARDS too. A highlight for me was a flyby of what looked like an immature VIRGINIA RAIL. It was very quite and calm morning with only 26 species being seen or heard, which is a low count for this area. It was a little warm but that didn't deter 9 birders showing up at 8am. We drove about 1.8 miles up NF049 to the bridge that crosses the creek. We heard CASSIN'S and WARBLING VIREOs at the beginning of the walk. Many PEWEEs, TANAGERs, PYGMY and WHITE-BREASTED NUTHATCHES. We found a GRAY FLYCATCHER on a nest with another flying nearby at Dry Pond. We heard a CLARK'S NUTCRACKER, CHIPPING and FOX (THICK-BILLED) SPARROWs feeding young. It was a very nice morning and as the the group gathered we heard 7 species in the parking lot. Nice start. At the start of the walk there were 13 birders ready for the day. We found 3 species of NUTHATCHES, RED-BREASTED, WHITE-BREASTED feeding young, and the last species of the day PYGMY coming out of a nest cavity. On the south side of the lake we encountered a flock of EVENING GROSBEAKs with one carrying nest material. Also, in that area we found PEWEE, GREEN-TAILED TOWHEE, and CHIPPING SPARROWs. We walked around the lake in a counter clockwise direction and as we walked through the Aspens we were stopped in our tracks by the numerous songs and activity. We encountered a pair of HAIRY WOODPECKERs, CASSIN'S and WARBLING VIEROs, ORANGE-CROWNED, NASHVILLE, WILSON'S, and YELLOW-RUMPED WARBLERS. On the east side of the lake we saw a pair of OSPREY with one diving and catching a fish and then flew into the woods with it. The were TURKEY VULTUREs with one flight of seven, and we saw 3 WHITE-HEADED WOODPECKERS. We ended up with 35 species by the end of the walk. Five of the group headed to Chimney Beach but no luck on the Pileated Woodpecker but we did pick up 4 more species including a COOPER'S HAWK, FOX SPARROW (THICK BILLED), and a RED-BREASTED SAPSUCKER. It was a pleasant morning and there were 13 birders that came out to Rancho San Rafael for the LAS field trip this past Friday. We walked through the arboretum where we saw a MOUNTAIN CHICKADEE, BLACK-HEADED GROSBEAK, WILSON'S and YELLOW-RUMPED WARBLERS. As we walked along Evan's Creek to the pond we saw WESTERN WOOD-PEWEE, YELLOW WARBLER, DOWNY WOODPECKER, and a COOPER'S HAWK perched in a tree. At the pond we encountered BARN SWALLOWS, a close encounter with a RUDDY DUCK, juvenile COOTs, and PIED-BILLED GREBES feeding 6 juveniles. The RED-WING BLACKBIRDS were busy nest building, we came across a MALLARD's nest with 7 eggs, and VIRGINIA RAILs singing in the cattails. We crossed under McCarran Blvd where the CLIFF SWALLOWS were nearly done building there nests. Evan's Canyon/Nature Trail had a few more warbles and pewee's but not as many as a couple of weeks ago. In the canyon we saw a flycatcher but we didn't get close enough to ID. We heard and saw 42 species along the walk. Don Molde and Fred Petersen visited Porter Springs to see about birds and BLM improvements to the site. Birds were scarce (a few of the regulars: WESTERN TANAGER, BULLOCK'S ORIOLE, GOLDEN-CROWNED SPARROW, YELLOW-RUMPED WARBLER)) but entertaining with a couple pairs of DUSKY AND GRAY FLYCATCHERS chasing each other around. WESTERN WOOD-PEWEES were active as well. It was brisk: 45 degrees, 20 mph wind. Burros and Pronghorn were seen but no Gopher snakes. 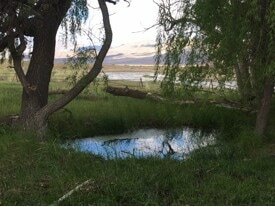 BLM improvements consist of rail fencing (replacing barb wire), bigger enclosure (expanded to the east), excellent water distribution (see photo of Jack's Pond), new pit toilet, graded parking area outside fence. Two picnic tables and three new fire pits are in place. After Porter Springs, we did the auto tour at Stillwater NWR where we saw a busy and entertaining CLIFF SWALLOW nesting site (over 100 nests) ringing the perimeter of the gazebo at the north end. A swing by Greenhead Duck Club (Carson Lake) confirmed closure of Carson Lake due to high water levels with lots more water to come!! We also saw the huge trench dug in the desert south and east of the Naval Air Station (goes under Highway 50 just east of Fallon) to direct spring runoff into the desert. Fun and entertaining day. We had a small storm pass through the night before the LAS field trip to Hunter Creek Canyon and it was cool, cloudy, and windy at the start of the walk. Seven of us were ready to get going at 8am to warm up and in less than a 1/2 hour we saw blue sky and then full sun that really warmed us up. The wildflowers were starting to bloom and the migrants were singing away with some starting to pair up. Of note were the LAZULI BUNTINGS: 5 singing males and 2 females. We had one singing BLACK-HEADED GROSBEAK, WARBLING VIREOS were chasing each other, HOUSE WRENS pairing up, a singing CANYON WREN, singing WESTERN TANAGERS, a singing OLIVE-SIDED FLYCATCHER as well as a DUSKY and WILLOW. We had a good number of warblers with us hearing and seeing WILSONS, YELLOW, YELLOW-RUMPED, and MACGILLIVRAY'S. Near the end of the walk we had a brief look at a BLUE-GRAY GNATCATCHER, HAIRY WOODPECKER, and a SAY'S PHOEBE. We ended the trip seeing and hearing 28 species. Nice trip. Yesterday's field trip to Davis Creek Regional Park started out calm sunny. Although the temperature was around 37F at 8am, the sun and almost no wind made it feel like to was 50F. There were 10 of us and as we gathered in the parking lot we had 11 species. Singing HOUSE and BEWICKS WRENS, SPOTTED TOWHEES, STELLARS JAYS. As I was explaining the habitat differences between the Stellars and Scrub Jays and that I didn't expect to see a CA SCRUB JAY one flew in and landed a few feet away from us. We first headed over to the pond and we first heard then saw an OSPREY and along the Nature Trail we found the CALLIOPE HUMMINGBIRD in the same spot I saw one last year. Near the end of the walk we found another Calliope and an ANNA'S HUMMINGBIRD feeding on the blooming manzanita. Other notable birds were a pair of WESTERN BLUEBIRDS, a TOWNSEND'S SOLITAIRE, BALD EAGLE flyover, a pair of BUSHTITS working on a nest, a BLUE-GRAY GNATCATCHER, and a singing PACIFIC WREN. The was plenty of nest building activity and at the end of the walk we had heard and seen 33 species. and heard 51 species. The next trip will be to Davis Creek Regional Park, FRI 4-21. We had a great group meet up the morning of April 1st, Fools Day. At 5:00am 15 of us carpooled our way up to the sage-grouse lek site we planned to visit, just north of Honey Lake. A week earlier the roads were impassible due to the continued precipitation we've been receiving this winter, though this morning we had no trouble getting right up to the site. And what a sight it was! We had a high count of 24 GREATER SAGE-GROUSE, INCLUDING FEMALES. They put on quite the show for us for over an hour, and with a small group of pronghorn antelope walking behind the lek, we were provided opportunity for some great photos. We lucked out with beautiful weather and left the sage-grouse to their business, while we wandered down to the Honey Lake State Wildlife Management Area. Approaching the turn into the wildlife area, snow geese were easy to both see and hear, with large flocks in an agricultural field giving us a show. We saw a total of 37 bird species that day including: GREATER SAGE-GROUSE, HORNED LARK, RED-TAILED HAWK, WESTERN MEADOW LARK, COMMON RAVEN, NORTHERN PINTAIL, EUROPEAN STARLING, BLACK-BILLED MAGPIE, BARN OWL, SNOW GOOSE, SANDHILL CRANE, GREATER WHITE-FRONTED GOOSE, KILLDEER, LONG BILLED CURLEW, MOURNING DOVE, COOT, MALLARD, NORTHERN SHOVELER, AMERICAN KESTREL, RED-WING BLACKBIRD, NORTHERN HARRIER, PHEASANT, MARSH WREN, CINNAMON TEAL, TURKEY VULTURE, AMERICAN WIDGEON, GREAT-HORNED OWL, SAVANNA SPARROW, CANADA GOOSE, BREWER'S BLACKBIRD, BEWICK'S WREN, TREE SWALLOW, CALIFORNIA QUAIL, WHITE-CROWN SPARROW, LOGGERHEAD SHRIKE, NORTHERN FLICKER, AND ACORN WOODPECKER. All-in-all, it was a great day out! It was a calm and warm morning but by the time the walk ended the wind picked up and the temperature dropped with the in coming storm. We started out on the east end of the marsh area east of the pond. First bird was a MARSH WREN then a pair of HARRIERS. Along the marsh to the pond there were YR WARBLER both MYRTLE and AUDUBON. RUBY-CROWNED KINGLET were showing off the red crest. Regular ducks and teal suspects. Highlight of the walk was a WILSONS SNIPE and 100+ Swallows only missing the Bank. Since the So Meadows Wetlands was close by, I headed over and saw all the species seen at Diamond Creek but added a GREAT BLUE HERON with a GREAT EGRET hunkering out of the wind and a flyover of an AMERICAN WHITE PELICAN. Great morning but any morning birding is great. Hope to see you out on the walks. It was a sunny, warm, Nevada day. We started at S-Line and Harmon Reservoirs where we saw a variety of ducks, including good looks at Canvasback, Redhead, and Ruddy Duck. We visited a Great Blue Heron Rookery on our way to Stillwater NWR, where we observed the herons in the trees on their nests. Surprisingly, one next was occupied by a Great Horned Owl. Once at Stillwater NWR, we went to Sillwater Point Reservoir overlook and then along the Auto Tour route to Upper and Lower Foxtail Lake. We saw several species of shorebirds, including Long-billed Dowitcher and Marbled Godwit, at upper Foxtail Lake. We viewed several hundred Tundra Swans at a distance on Lower Foxtail Lake. We concluded the tour with a visit to the Fallon Paiute-Shoshone Tribal wetlands where we had close views of Tundra Swans and other waterfowl. See previous years' Field Trip Rpts here. See Christmas Bird Count page for 2016 and 2017 results.